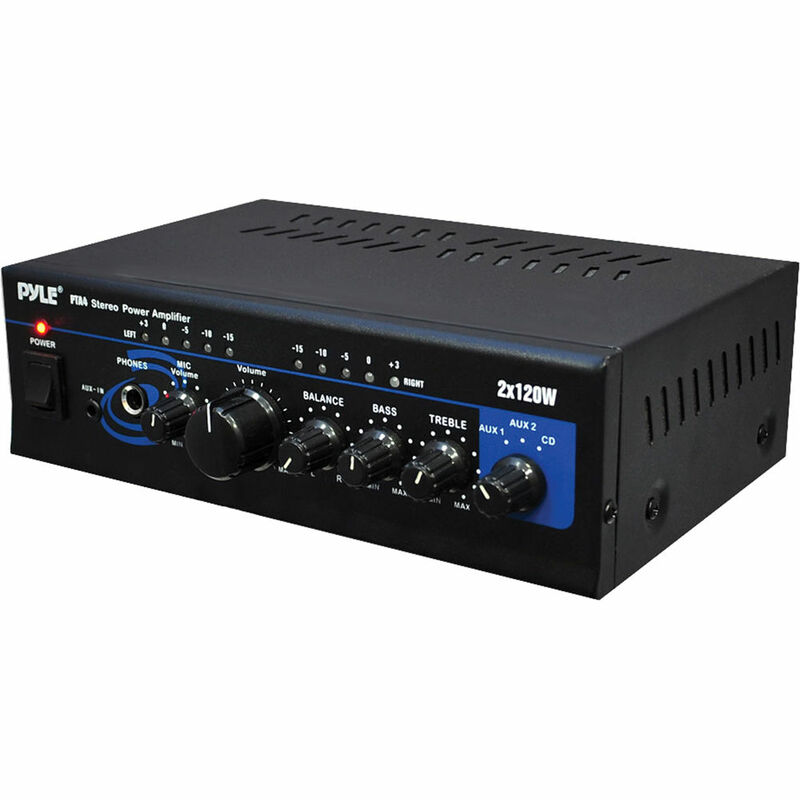 The Pyle Pro PTA4 Mini 2 x 120 Watt Stereo Power Amplifier w/ AUX/CD Input is an all purpose amp that works well in home, corporate and performance environments. This amp's switchable microphone, pager and mixing modes makes this a true multi-purpose amp that suits public address duty and as an amplifier for singers and musicians. Box Dimensions (LxWxH) 9.8 x 7.7 x 4.1"
PTA4 Mini 2 x 120 Watt Stereo Power Amplifier w/ AUX/CD Input is rated 4.3 out of 5 by 12. Rated 3 out of 5 by Anonymous from Pyle Pro PTA4 Clean audio amp for low power applications. However, the stated wattage output is MISLEADING! Actual RMS wattage output (according to the manual) is 20W x 2 into 4 ohms @1% THD and 32W x 2 into 4 ohms @ 10% THD. This equates to 10W & 16W into 8 ohms respectively. Rated 4 out of 5 by Tanker Trash from I would buy this again The mini size makes it easy to find a spot to mount it, only draw back is one set of speaker output. Easy to install. Rated 4 out of 5 by Hoby from Excellent piece for the $$ An excellent little piece of kit for the money. Of course, were not talking audiophile quality, but for $60 it would be unreasonable to expect that. Nice compact size but with a confidence-inspiring heft. The separate Bass and Treble controls help compensate for any weaknesses in speakers. A great foundation for a low-cost system. Would definitely buy another one and would heartily recommend it to others. Rated 3 out of 5 by Anonymous from Does the job just fine I bought the Pyle amp to power Bose Accoustimass 3 speakers for a tv. Connected the amp to a blue ray player and a computer. Sounds good. The knobs are a little hard to turn to switch between sources and the LED lights are too bright. I will probably turn it sideways. For the price, I can deal with the little annoyances. Rated 5 out of 5 by Steven from Just what I was looking for Purchased The Pyle Pro PTA4 for my home office to power a pair of speakers to improve the sound quality from my Desktop computer. For less money than a quality pair of powered speakers this little space saver now drives a pair of Polk Audio bookshelves. Nice upgrade. Rated 5 out of 5 by Nelson from Great Purchase! I am delighted with this little amp. I carefully researched it on line and it lives up to the specs and praise it has received from previous purchasers. Rated 4 out of 5 by DaneO2 from Great unit with power and versatility The product is great and I want to buy more of them because they work so well. It adds great boost to my parties and allows for an easy mic setup. How to troubleshoot a PYLE PTA4 amplifier, when i turn it on the blue LED just blink and gone though power indicator stay on? Pyle Pro PTA4 Mini 2 x 120 Watt Stereo Power Amplifier w/ AUX/CD Input B&amp;H # PYPTA4 MFR # PTA4. CAN YOU TELL ME IS THIS A 4 OR 8 OHM AMP? 4 ohm is the basis for the power rating. Answered by: WILLIAM G V.